To my mind this is arson of the worst kind. I have no idea how this problem can be addressed other than to lobby the legislators to fix penalties of the highest severity on those responsible - if they are ever caught. This is not just stupid vandalism. The intentions may be simply to destroy evidence on a stolen vehicle, but this is arson of the highest order. These are criminal acts and the implications are horrific. As locals we must be vigilant and prepared to report immediately the suspicious movement of vehicles on the bush tracks. But it doesn’t stop there. The accumulation of burnt-out car bodies presents an ongoing problem for our environment. 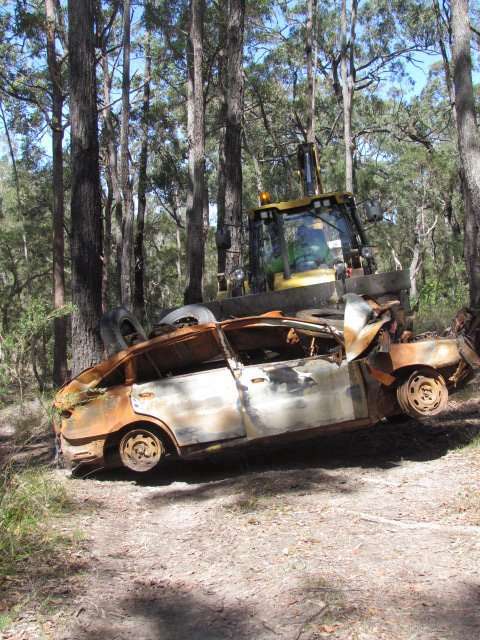 Our efforts through Clean Up days over recent years have done much to reduce a huge backlog of rubbish in the bush, but we simply can’t remove the cars. Amongst others, I have tried to get the Council to help us but the response has always been that it doesn’t have the resources. Well some good news! Through sheer dogged persistence, one of our residents, Nigel Tully, has managed to get most of these wrecks pulled out of the bush and carted off. In recognition of the problem, Nigel scoured the surrounding bush and tidal flats, google mapping the area, logging and photographing the wrecks. After completely failing over several months to get a response from Forster, he eventually found an ally in Tea Gardens – Drew Martin who runs the Council Tea Gardens depot. Drew managed to find the time and put together a crew and resources which included a truck, tracked front end loader and a willing posi-tracked bobcat operator from Taree. The logistics behind the removal operations have been complicated. Several of the vehicles were on or adjacent to the tidal saltwater flats on both sides of Balberook Creek. They were accompanied by piles of other rubbish, even asbestos. More wrecks littered the shores of the Cove and Bulga Creek and the Bulga Creek crossing. Before Christmas, a car was set alight just off Promontory Way towards Beauty Point. In total, about ten vehicles in various stages of decomposition have been removed. Nigel says that he has evidence suggesting that not all the cars originated from outside our village. He reports that the manager of the Tea Gardens tip has advised that they will take in car bodies for no charge which means there is no excuse for anyone in our village to dump cars in our back yard. Nigel couldn’t have done this without them, so I think we as a community owe them a great big Thank You! I suggest when any of us are out that way, we drop in to give this message to Drew and Mattie (the foreman) and their people. Perhaps our Residents’ Association could forward a formal written message of thanks to these people? This is an epic story and we residents of North Arm Cove are truly indebted to Nigel and co.